An additional departure from Maribor towards Selnica ob Dravi at 7.45 and return drive to Maribor at 8.10 will be added. The existing departure at 12.20 from Lenart v Slovenskih Goricah towards Maribor over Jurovski Dol will change to 11.50. The existing departure at 12.45 from Selce v Slovenskih Goricah will change to 12.35. The departures on relation Ptuj – Juršinci – Ptuj at 6.50, 8.30, 12.30 and 14.30 will change or will be prolonged to Mala Nedelja à Ptuj – Juršinci – Mala Nedelja – Juršinci – Ptuj. The departures from Ptuj towards Ormož will be moved from 6.35 to 6.30 and 14.20 to 14.30. Also, an additional new drive at 11.00 in the direction towards Ormož will be added. Deaprtures from Ormož towards Ptuj will change from 6.00 to 5.55, 7.10 to 7.05, 13.20 to 13.15 and 15.30 to 15.25. Also, an additional, new drive will be added at 10.00 in the direction towards Ptuj. The existing departure at 10.25 from Žetale towards Ptuj will be moved to 10.50. Departures from Ptuj towards Žetale will changed from 9.25 to 9.00 and 12.20 to 11.50. A new departure from Žetale towards Ptuj at 17.30 and from Ptuj towards Žetale at 19.20 will be added. The existing departure at 10.00 from Ptuj towards Velika Varnica will be changed to 9.30, the departure at 11.00 will changed to 11.20 and the departure at 15.20 to 15.30. The existing departure at 7.05 from Velika Varnica towards Ptuj will change to 7.00, departure at 10.40 to 10.00 and departure at 11.40 to 11.50. A new departure from Ptuj towards Velika Varnica at 20.20 and return drive from Velika Varnica towards Ptuj at 18.50 will be added. The existing departure at 12.20 from Ptuja towards Stoperce will change to 12.45, the departure at 14.20 to 14.30. A new departure from Ptuj to Majšperk Breg will be added at 15.25. 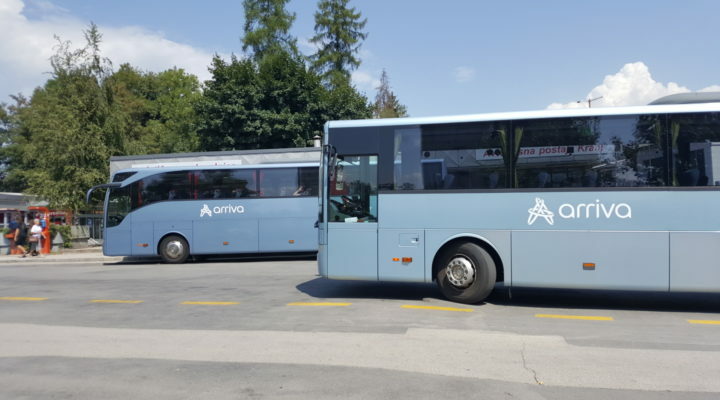 Existing departure at 5.50 from Majšperk Breg towards Ptuj will change to 6.02, departure are 6.55 from Stoperce will change to 6.50 and departure at 13.15 to 13.30. A new departure at 16.00 from Majšperk Breg towards Ptuj will be added. The existing departure at 5.55 from Ptuj will change to 5.45. Existing departure at 16.30 from Ptuj to Gomilce will change to 16.35. A new departure from Ormož to Ljutomer at 11.40 and new departure from Ljutomer towards Ormož at 8.40 will be added. New departures from Ptuj towards Maribor at 9.35, 10.35, 11.35 and 20.05 and return drives from Maribor towards Ptuj at 9.35, 10.35, 11.35 and 21.10 will be added.